Vincent William van Gough a famous Dutch artist whose work often associated with Post-Impressionism and later transformed in to Expressionism. Vincent Van Gogh was one of the most important predecessors of modern painting. He created a great number of masterpiece paintings and drawings in just one decade devoted to art. Vincent van Gogh was born on March 30, 1853 in Netherlands. 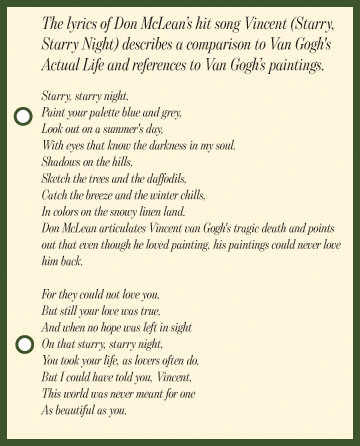 Since his childhood Van Gogh had an immense passion for art. Van Gogh was an outstanding mostly self taught artist whose famous works include: Starry Night, Cafe Terrace at Night, Terrasse, Houses at Auvers, Restaurant De La Sirene At Asnieres, Sunflowers, Irises, and several self-portraits, amongst others. Most of his best-known work was created in the last two years of his life. Van Gogh used color for its “symbolic and expressive values” rather than to reproduce light and literal surroundings. Van Gogh’s emotional state highly affected his artistic work and it deeply analyses his unconscious mind. Several psychodynamic factors may have contributed to his art work. The psychoanalyst Sigmund Freud viewed art as a privileged form of neurosis where the analyst-critic explores the artwork in order to understand and unearth the vicissitudes of the creator's psychological motivations. In this context van Gough’s art represent a deep psychological sketch. He left a profound, soul-searching description of his jagged life in his art work. Though Van Gogh had little financial success as an artist during his lifetime and often lived in poverty, his fame grew dramatically after his death. Today van Gough’s name is considered to be one of the world’s most renowned, respected, and influential artists. But he could not live long enough to see his fame. His life was filled with misery and desolation and this suffering was painted in an artistic way. 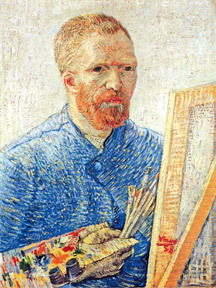 The tragic life of Vincent van Gogh could be summarized emphasizing his early departure from formal education, failure as a successful salesman in the art world, attempt at religious studies, difficulty with female and family relationships, return to the art world, and tendencies toward extremes of poor nutrition or near self-starvation and excessive drinking and smoking. 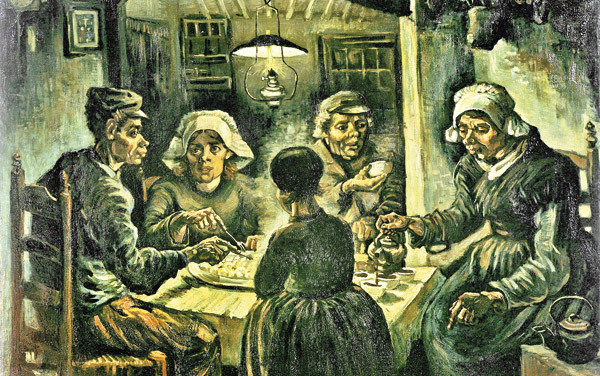 His oil painting” the Potato Eaters” clandestinely depicts poverty and destitute experienced by the artist. Van Gogh suffered from complex psychiatric ailments. Apart from the illness excessive use of tobacco and alcohol made a negative impact on his mental health. The mental illness that plagued him affected his art work. Van Gough painted his anguish and despair on canvas. His brushwork became increasingly agitated. The striking colors, crude brush strokes, and distorted shapes and contours, express his disturbed mind. He suffered two distinct episodes of reactive depression, and there are clearly bipolar aspects to his history. Both episodes of depression were followed by sustained periods of increasingly high energy and enthusiasm. His life was full of mental conflicts. He fought with his inner mind. This dual nature was observable. He had attacks of melancholy and of atrocious remorse. His colors lost the intensity His lines became restless. He applied the paint more violently with thicker layers. Van Gogh was drawn to objects in nature under stress: whirling suns, twisted cypress trees, and surging mountains. Although van Gogh’s illness emerged more violently he produced brilliant works as The Reaper, Cypresses, The Red Vineyard, and his famed Starry Night. From the beginning of Van Gogh's artistic career he had the ambition to draw and paint figures. For Vincent van Gogh color was the chief symbol of expression. Contemporary artists admired van Gogh’s passionate approach to art. But he viewed his life as horribly wasted, personally failed and impossible. On the contrary he was able to produce deeply moving images while living a life of ultimate desperation in an increasing state of mental imbalance. He was friendly with the French Post-Impressionist artist Paul Gauguin and two friends inspired each other. However they frequently quarreled. Van Gogh had an eccentric personality and unstable moods. His reactive depression episodes were followed by a prolonged period of hypomanic or even manic behavior. The life and artistic legacy of Vincent van Gogh has generated great interest among physicians from different areas of specialization in proposing a retrospective differential diagnosis. Vincent Van Gough suffered from medical crises that were devastating, but in the intervening periods he was both lucid and creative. Vincent van Gogh's illness has been the object of much speculation. Explanations as disparate as acute intermittent porphyria, epilepsy and schizophrenia have been proposed. Some experts suspect physical and psychiatric symptoms of Vincent van Gogh may have been due to chronic lead poisoning. According to Arnold (2004) an inherited metabolic disease, acute intermittent porphyria, accounts for all of the signs and symptoms of van Gogh's underlying illness. Porphyria is a rare hereditary disease in which the blood pigment hemoglobin is abnormally metabolized. Porphyrins are excreted in the urine, which becomes dark; other symptoms include mental disturbances and extreme sensitivity of the skin to light. Van Gogh probably suffered from partial complex seizures (temporal lobe epilepsy) with manic depressive mood swings aggravated by absinthe, brandy, nicotine and turpentine. In addition he was troubled by intense death wish. Suicidal gestures by Vincent depicted in his last paintings. He painted vast fields of wheat under dark and stormy skies, commenting, “It is not difficult to express here my entire sadness and extreme loneliness”. In one of his last paintings, Wheat Field With Crows, the black birds fly in a starless sky, and three paths lead nowhere. It could be interpreted as the emptiness that existed in his heart. Mehlum (1996) believes that an early childhood trauma initiated a life-long suicidal process in Van Gogh. His difficulties as regards attachment to and separation from his parents continued throughout his life and his emotional instability, intensity and lowered tolerance to frustration seem to portray a borderline personality. Van Gogh's self-portraits play significant clinical importance. Vincent van Gogh was born one year to the day after a stillborn brother of the identical name, including the middle name, Willem. In the parish register van Gogh was given the same number twenty-nine as his predecessor brother. Van Gogh's fantasies of death and rebirth, of being a double and a twin, contributed to both his psychopathology and his creativity. Van Gogh's self-portraits are regarded as relevant to his being a replacement child (Blum, 2009). Meissner (1993) hypothesized that the self-portraits of Vincent van Gogh are seen as repeated and unresolved efforts at self-exploration and self-definition in an attempt to add a sense of continuity and cohesion to a fragile and fragmented self-experience. The portraits are painted in mirror perspective; Vincent's search for identity is thus seen as mediated by the dynamics of the mirroring phenomenon. Auto-mutilation became a part of his medical history. In 1888 Vincent’s mental health was very unstable. As a result of psychotic crises, Vincent van Gogh was hospitalized several times. His state of mind was very weak and during a breakdown, he mutilated his ear. Van Gogh cut off the lower half of his left ear and gave it to a prostitute. After a few weeks he was able to paint self-portrait with bandaged ear and pipe (Portrait of a one-eyed man) which shows him in serene composure. During the last few years of his life, his paintings were characterized by halos and the color yellow. Critics have ascribed these aberrations to innumerable causes, including chronic solar injury, glaucoma, and cataracts (Lee, 1981). Vincent van Gogh's chronic suicidal ideation and behaviour led to a series of crises throughout his life, escalating during the last 18 months before his suicide in 1890. It is possible to identify at least three prominent suicidal motives in van Gogh's case. The first is unbearable emotional pain related to personal experience of loss which reactivated the childhood trauma. The second is introverted murderous rage arising from conflicts with other persons. The third motive described is the need for a cathartic release of energy and emotion (Mehlum, 1996). Pezenhoffer and Gerevich (2015) found distal suicide risk factors in Vincent van Gogh. They highlighted: family anamnesis, childhood traumas (emotional deprivation, identity problems associated with the name Vincent), a vagrant, homeless way of life, and failures in relationships with women, and psychotic episodes appearing in rushes. In addition the proximal factors included the tragic friendship with Gauguin (frustrated love), his brother Theo's marriage (experienced as a loss), and a tendency to self-destruction and this trait aggression played an important role in Van Gogh's suicide. Vincent van Gogh committed suicide in 1890 at the age of 37. Despite the mental illness he suffered Vincent remained marvelously creative until his death. Although he lived a relatively short period he left behind an astonishing body of work which included several hundred paintings. Van Gogh's painting not only reflected his struggles but also enabled him, for a time, to stave off the hopelessness and despair that eventually overwhelmed him, culminating in his suicide. Despite his turbulent life Van Gogh remains as one of Europe's greatest artists.